The Philadelphia Eagles celebrate their first Super Bowl victory at the U.S. Bank Stadium in Minneappolis, Minn., Feb. 4. The Eagles outlasted the New England Patriots 41-33 to win Super Bowl LII. Courtesy of Rahul Uppal. 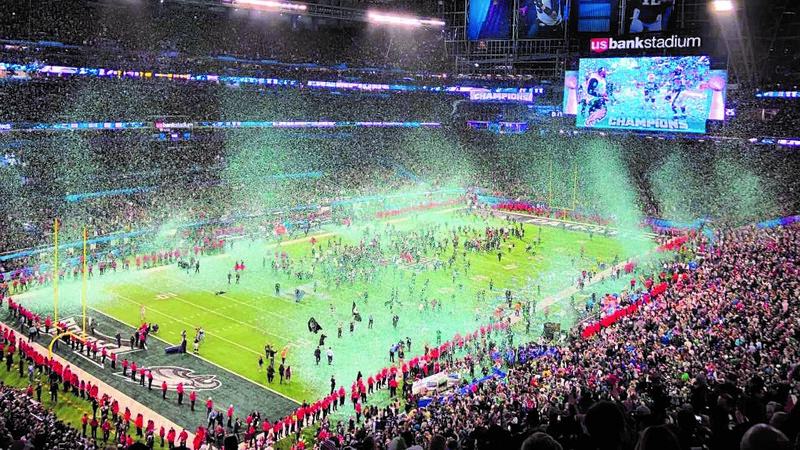 In the greatest offensive display in Super Bowl history, the Philadelphia Eagles outdueled the New England Patriots 41-33 to win Super Bowl LII. This is the Eagles’ first ever Super Bowl title, delivering sweet redemption to their rabid fan base after the team’s 2005 loss to the Patriots in Super Bowl XXXIX. The Eagles sealed the victory when defensive end Brandon Graham strip-sacked Patriots quarterback Tom Brady during what was set to be a classic game-winning drive for the Patriots. It was the only sack of the game, and it was the Eagles’ only forced turnover, but they certainly made it count. Super Bowl MVP went to Eagles quarterback Nick Foles, who threw the game-winning two-yard touchdown pass to tight end Zach Ertz with 2:21 remaining. Super Bowl LII was one of the most exciting in recent history in light of a number of broken records. The game was a combination of trick-plays and fourth-down conversions as both teams brought an aggressive offensive mindset to the contest. The two offenses consistently took chances, and the risks paid off, which resulted in a game that played host to only one punt per side. Offense was the name of the game as the teams combined for a playoff record 1,151 total yards. The Patriots had 613 yards, the most ever for a losing team in the playoffs. Philadelphia Head Coach Doug Pederson told Bleacher Report Feb. 4 that the team’s dynamic offense was the result of an aggressive game plan. Despite the Patriots’ failure, Brady delivered another incredible performance, throwing for 505 yards and three scores in the losing effort. The passing mark broke the record he set one year ago against the Atlanta Falcons in Super Bowl LI. Brady added to his all-time lead in Super Bowl passing yards and touchdowns, becoming the first player to throw for 10,000 yards in the playoffs. Matched up against arguably the greatest quarterback of all time, Foles held his own. Philadelphia lost first string quarterback Carson Wentz in early December 2017 due to a torn ACL. Stepping out of the on-deck circle was Foles, whom many viewed as the Eagles’ greatest liability. Foles was impressive in the biggest game of his career Sunday as he passed for 373 yards and three touchdowns, along with a brilliant touchdown catch at the close of the first half. Eagles star defensive end Chris Long gave his support to Foles. Foles’ touchdown reception came at a key point in the game — the end of the second half. He caught the pass from tight end Trey Burton on a fourth-down play. This trick play had a completely contrary result off a similar trick play from the Patriots. Brady had dropped a pass from wide receiver Danny Amendola even though Brady had no one near him. Foles also threw one interception from a deep throw to wideout Alshon Jeffery that the wide receiver almost caught with one hand. But Jeffery tipped the ball into the air and eventually into the hands of Patriots defensive back Duron Harmon. Notably absent from the Patriots secondary was cornerback Malcolm Butler, who was benched for reasons that, at present, remain unclear. Pederson did not lose trust in his quarterback even after the turnover, putting his faith into Foles on the Eagles’ game-winning drive on a fourth-and-one conversion near midfield. Eventually, Foles hit Ertz for a touchdown pass at the end of the drive. Philadelphia running backs LeGarrette Blount and Jay Ajayi did the heavy lifting for the Eagles. Blount rushed for 90 yards and a touchdown off 14 carries against his former team. Ajayi ran for 57 yards on nine carries. From the pocket, Foles kept the Patriots defense guessing. Running back Corey Clement turned in a team-high 100 receiving yards on four catches. Jeffery impressed with three catches, 73 yards, and a touchdown. Ertz had seven catches for 67 yards and a touchdown. Nelson Agholor rounded out a solid game for the receiving unit with nine catches for 84 yards. On the Patriots’ end, Brady’s throws went to a trifecta of targets in Amendola, wide receiver Chris Hogan and tight end Rob Gronkowski. “Playoff” Amendola continued to impress with 152 yards on eight receptions. Gronk found the endzone twice with 116 yards on nine receptions and Hogan hauled in 128 yards on six catches. In a game marked by brilliant offensive performances, special teams errors stood out like a sore thumb. Patriots kicker Stephen Gostkowski, one of the most dependable kickers in the NFL, missed an extra point and a 26-yard field goal off the upright. Kicker Jake Elliot converted all three of his field goals but missed an extra point in the first quarter. After almost two decades of success, the Patriots dynasty might be nearing a close. Brady’s fight against Father Time can only be delayed for so long. Head Coach Bill Belichick will also lose defensive coordinator Matt Patricia as he transitions into a new head coaching job with the Detroit Lions. The Pats will have a lot to look over this offseason as they need to bolster their defensive line and secondary. With Wentz set to return next year, Foles is still under contract. His future is uncertain, and the Eagles may want to cash in on his peak value. The Eagles may lose much of their wide receiving core to free agency and will also need to improve their defensive secondary. Questions surrounding the futures of both teams will be answered later. As of now, much of Philadelphia will be celebrating and tearing down their city after their first ever Super Bowl win. Light poles and a Ritz-Carlton awning have already fallen down. One can only hope that this Super Bowl win might soften the hearts of the Eagles fanbase notoriously known for its unforgiving attitude.